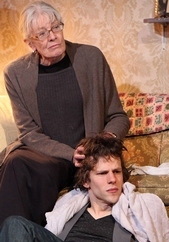 It’s hard to fathom at first why David (Jesse Eisenberg), the young American who has just been welcomed by the elderly Maria (Vanessa Redgrave) into her modest apartment in Szezecin, a large port city in Poland, would be so observably nervous and on-edge. He enters without any outward show of respect, warmth or affection for the Polish-Jewish woman who has been anxiously awaiting his arrival from America. David’s jittery behavior and curt reactions to Maria’s attempt at hospitality would seem to indicate the kind of social defensiveness and awkwardness often associated with those with Asberger’s Syndrome. Well, that’s my take if not necessarily the playwright’s. At any rate, under the circumstances that prevail, it’s never a consideration. Maria is clearly hurt by his refusal to sit down and eat the chicken dinner she has prepared for him. His claim to be a vegetarian is not nearly as strange and unsettling to her, however, as is the dispiritingly evidence of witnessing him as a substance abuser when he is alone in the one bedroom she has relinquished for his comfort. But it will be the duplicity and insincerity of his visit that will be even more discouraging. David is portrayed by Eisenberg with enough neurotic fidgeting and ill-tempered social graces to suggest this character needs more help in finding himself and corralling his talent than this week-long visit with his presumably second cousin. A writer who has had a modest success with his first book for “young adult readers,” David has been suffering the proverbial writer’s block. Turned down by various writers’ colonies, he finally, after traipsing around the world, has taken his grandfather’s advice to visit Maria, with whom the American side of the family has had only limited contact. Does Maria, who has followed David’s career —she has a framed copy of the New York Times review of his book on the wall — and has photos of other family members filling up the walls imagine that David has come all this way to hear her story as a survivor of the holocaust? If she doesn’t know how to broach the topic, she also doesn’t seem able to penetrate David’s overt hostility. She is tolerant as we are subjected to David’s flaws to the point of annoyance. But how long do we have to wait before his intentions are revealed? We are able to see how David makes clear that he has little interest in familial empathy either at home or here and that he has no interest in establishing a bond of kinship with Maria who does everything but dance a jig to make him feel comfortable and welcome. It's hard to understand David’s agenda? What is even harder to understand is the apathy he directs toward Maria’s close male friend Zenon (Daniel Oreskes) whose visits provide some interesting examples of diverse cultural humor. In one of the play’s few amusing moments, David attempts to perform the famous “Who’s on first” routine to the delight of Maria. Unfortunately, very little of what happens during the course of the play makes as much sense as that Abbott and Costello routine does. 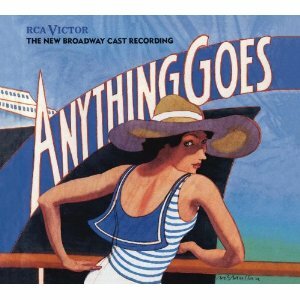 With The Revisionist, Eisenberg is once again starring in a play he has also written. As with Asuncion , also produced by the Rattlestick Playwrights Theater, he has director Kip Fagan tying its occasionally interesting aspects together. The multi-talented Eisenberg (Oscar nominated for playing Facebook founder Mark Zuckerberg in The Social Network) has apparently drawn his inspiration from family history, specifically a visit by him to the town in Poland where his 100 year-old aunt had emigrated. All well, good and noble, but he has done a disservice to his central character by making him appear as a totally self-centered, incorrigible jerk without a single redeeming quality. Tne one fortunate element within the play is the character of Maria, as played by Redgrave with a wonderfully textured display of emotions and fractured-English that somehow withstands David’s egregious displays of emotional immaturity. We listen intently, as one is obliged to do given the long wait for supposed revelations, as Maria does, indeed, recount the tragic circumstances that she survived. They are the twist in the plot that turns out after all to be rather predictable. There are a number of lapses in credulity. They begin (silly as it is) with David coming to Poland without having his cousin’s telephone number, although it is somewhat amusingly addressed in an opening exchange. Then we begin to wonder how he managed to get through customs inspectors and the dogs with his stash of marihuana and its accompanying pipe — not to mention leaving Poland without making sure that they are safely hidden, especially in the light of Zenon’s hurried and sloppy packing of David’s suitcase. It is, however, the lack of clarity with regard to David’s intentions and motives that fails to define him as a needy human being and worthy of either our or Maria’s concerns. We never see this incredibly shallow young man for an instant as someone whom we might care to understand. He is certainly difficult to tolerate during the time he is afforded within the homey, sentimental confines of the apartment that designer John McDermott convinces us is Polish contemporary.